Visit Agaggio during your stay in Liguria, Italy. There are excellent possibilities for you to discover the entire valley from here. It could be feasting in Molini di Triora where the village community gathers in September for the snail celebration of the "Sagra Della Lumaca", a stroll in the narrow lanes of Montalto where opera festivals and classical concerts take place during summer, or it could be gazing in amazement in Triora where small witchesÂ shops and the ethnography museum keep the legend of the witch trial in the 16th century alive. Even wall-climbers and mountain-bike fans find a great variety of walkways and climbs here with different levels of difficulty. If you follow the winding way uphill to Agaggio Superiore, you will be overwhelmed by the serene quiet and the breathtaking view. During spring, the village is turned into a sea of flowers and in the course of the summer the fruits ripen on the numerous fruit trees and vines. While here, you can forget the daily routine and enjoy the quietness and the marvelous mountain air. Agaggio extends over two localities in the idyllic Argentina valley. 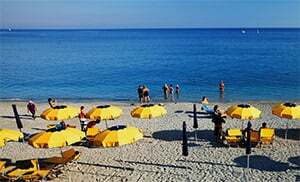 Agaggio Inferiore lies on the shores of the Argentina valley which beckons one to swim and sunbathe in several places in the valley. Agaggio is a village in the Imperia province which lies in the Liguria region. Near Agaggio are several other villages like: Grattino (3.7 km), Costa (6.7 km) and Glori (5.5 km). From Genoa take the Arma di Taggia E80 highway exit. Continue along the Via Beglini and then in the direction of SS548 towards Molini di Triora.